We had heard back in September that the feature would be coming, and Facebook has finally announced the official rollout. Photo Sync is finally coming to mobile devices. The rollout of the feature starts today and should hit your Android or iOS device soon. The feature is one that we've seen before. Google+ started the automatic upload trend in its Android app, and the feature has spread. 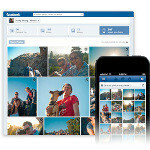 Now, Dropbox and others also offer automatic photo uploading. Facebook's Photo Sync will work just like Instant Upload from G+, which means that the photos you take on your mobile phone will be automatically uploaded to a private album to make it easier to then share with friends. None of the automatically uploaded images will be made public or shared without your consent, but we should mention that Facebook does take a broad copyright license on your content, and no meme post can stop that. So, just be careful with your data. The Photo Sync feature will be rolling out soon, and will not be turned on automatically. You'll have to go into your Facebook app settings to turn it on, and then the Photos section of the app will have a new "Synced" tab to view your uploaded photos. Great, now whenever guys take a picture of their member in all of it's glory, it's going to accidentally end up on facebook for your viewing pleasure. Its not like that actually... Your photo remains private, and only if you share it others will be able to see it... It is just like G+ indeed.